I have a suggestion on how you (and others like you) can make much more money than you realize. You both obviously know that by ditching the middleman and going straight to your public, you get a much larger piece of what you sell. And you both clearly know how to reach your public without the help of a middleman, and that you and your public are partners in a collaboration. But what you probably don't know is how a radical new pricing process, a sort of Pay-What-You-Want (PWYW) on steroids, can significantly increase your total revenues -- and profits. Radiohead knows that PWYW can be a very effective way to reach your market, getting far more people to buy, and many of them to pay reasonably well. But both of you know that many pay nothing at all. ...PWYW is is participative, but flawed. 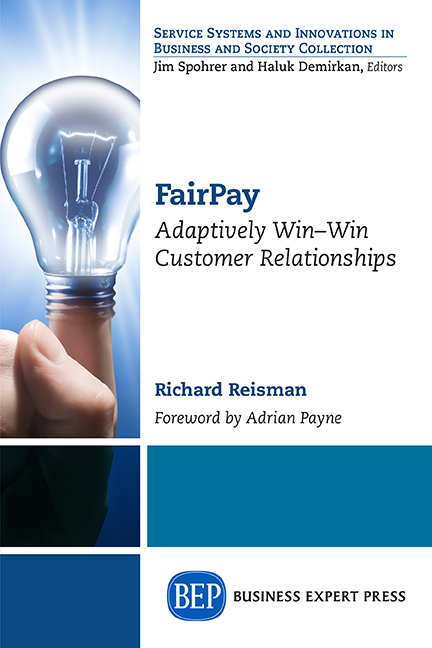 FairPay (Fair PWYW) is a radically new pricing process that builds on the flexibility and participation that PWYW offers to buyers, but motivates them to pay fairly. It works where there is an ongoing relationship of continuing sales, and tracks how fairly buyers pay. If they pay fairly, the seller continues to extend more FairPay offers to them. If they do not pay fairly, they lose the privilege of continuing to buy on a FairPay basis, and must pay a conventional set price for future purchases. 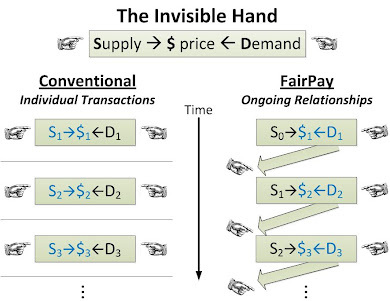 Unlike PWYW, FairPay is a two-way dialog that creates consequences for not paying fairly. The process begins with one of a few low-value items, to test how the buyer sets prices. If the prices are reasonable, a few more items are offered. As the buyer builds a reputation for pricing fairly, more FairPay credit is extended (but never so much that there is too much risk that the buyer is done and will pay nothing for a valuable bundle). So perhaps it might better be called Pay-What-You-Think-Fair, because that is the result. I suggest FairPay can produce far more sales than any set-price offer, and far more revenue and profit than any simple PWYW offer. For Seth, this may be easy to apply now to the extensive library of materials you already offer, and have full rights to control. For Radiohead, this might work when you have at least a second album you have full rights to offer songs from. cycles for the feedback process to fully develop. The task of developing the FairPay e-commerce platform will be spread across more sellers, and the buyers' FairPay reputations will be shared by all of the sellers. This could be a back-end service, so that you can keep your direct relationship with buyers, and you can sell to everyone interested in buying at a price they think fair -- and you control the offer decision process, to limit your exposure to the few buyers who pay what you do not think fair. Much more detail is given elsewhere on this blog, and the FairPay Web site -- the FAQ is particularly recommended. To Radiohead and Seth, I suggest you think about this. If you want to try it, I would be happy to assist. To other content creators (including video, games, apps, software, etc. ), I suggest the same. Think of this as the next step in C2C (Creator to Consumer) commerce. To entrepreneurs and developers looking for a killer business opportunity, I suggest this is it. Again, I would be happy to help. And to Amazon and Apple, of course you could do this too, as described in an earlier post. 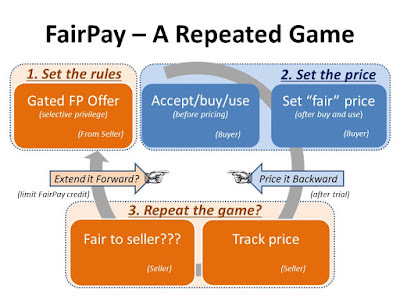 A FairPay Zone within your store could offer products from creators and/or publishers who agree to offer FairPay pricing, and you could facilitate the offer-pricing-reputation(-offer...) cycle. Sellers can be expected to make these consequences clear when they first extend an offer to sell on a FairPay basis. The product/service is not offered as "free," nor as simple PWYW, but as Fair PWYW, or perhaps better put as Pay What You Think Fair -- essentially on trial, on approval, and on evaluation. Sellers would make it clear that zero is "acceptable" (with regard to reputation and future consequences) only when that is arguably fair. Such cases of reasonable fairness in setting a zero price might include cases in which the buyer gives a reason why there is little or no realized value to the buyer (much as is often required for returns), or where only very low quantities are sampled (which might be conventionally understood as a buyer-directed form of free sampling). See more FAQs, and further information on the FairPay Web site.